Visit the Chicago Cubs Spring Training home, Sloan Park and bask in the warmth of sunny Arizona in the month of March! The Cubs stunned the world with their 2016 World Series win and the upcoming 2019 Season could be one of the history books again. Watch the Cubs as they play in Spring Training games and trim their roster at their home base in Mesa, Sloan Park. Our Cubs Spring Training packages include lodging, rental car, game tickets, and more! Join us in Arizona this spring! The warm sun, the desert scenery, and great baseball. Take your spring vacation to Arizona and enjoy an incredible weekend of baseball and relaxation. What's included in our Spring Training Packages? 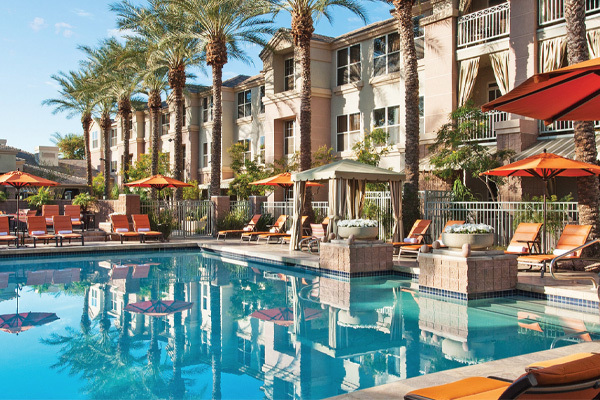 Choose from hotels located in the heart of Scottsdale, Tempe, or Mesa, close to golf courses, shopping, dining! We offer resort-style, full-service, limited service, or boutique hotels. Many feature spacious suite-style rooms with residential style kitchens, outdoor pools and cabanas! Custom build your Spring Training Trip! What does your Cubs Spring Training Trip look like?